Moderates remain uninsulted, but give it a few hours. 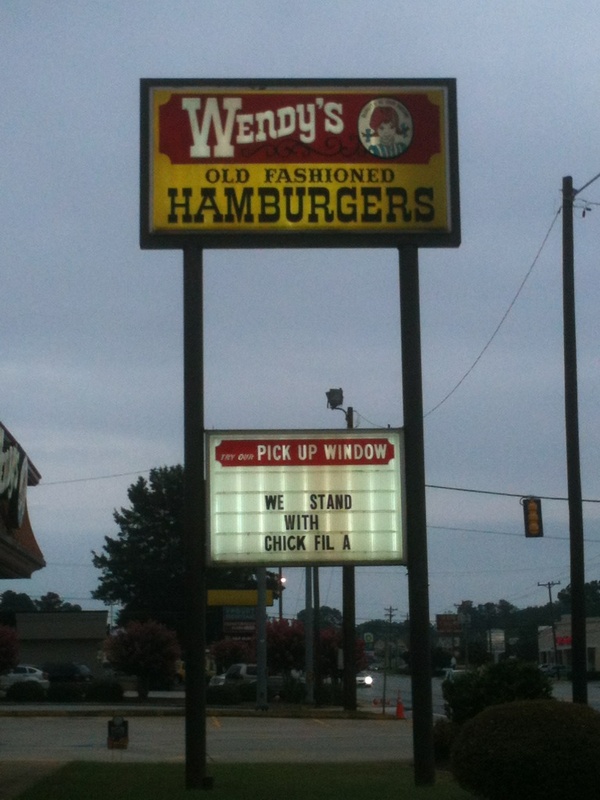 This message was displayed on numerous North Carolina Wendy's signs this morning. The sign, and its implied support of Chick-fil-A's stance on gay marriage, was the work of Jim Furmen, who owns 86 Wendy's franchises in North Carolina. When pictures of the signs were posted on Reddit and began circulating online, Wendy's quickly took to Twitter to say the franchise owner did not represent the views of the entire company, saying “We proudly serve ALL customers" and adding that the signs had been taken down. Conservative bloggers and writers then took issue with the insinuation that Chick-fil-A did not serve all customers (even its critics haven't made that charge), whereupon Wendy's backtracked. "Not our intention at all," Wendy's said repeatedly to users that criticized them. "We're simply saying that an independent franchisee posted the sign." They went on. "We're honored to serve every customer," Wendy's said in another Tweet. "We'd assume they are as well!" As of press time, Wendy's has apologized so much on Twitter that it's had to ask critics (like Breitbart.com's Dana Loesch) to retweet its responses because it's running up against the service's posting limit. RT @RBPundit: Hey @Wendys, it seems you&#39;re confused. Chick-fil-A proudly serves ALL customers, too. You seem to be implying they don&#39;t.
@dcseth An independent franchisee posted the sign, which he&rsquo;s taken down. We proudly serve ALL customers! @msnbc An independent franchisee posted the sign, which he&rsquo;s taken down. We proudly serve ALL customers! @ThomasARoberts @RJasonCottrell @tlrd An independent franchisee posted the sign, which he&rsquo;s taken down. We proudly serve ALL customers! RT @SooperMexican: Why does @Wendys&#39; profile seem like a threat? @AlexaShrugged An independent franchisee posted the sign, which he&rsquo;s taken down. We proudly serve ALL customers! RT @NolteNC: . @Wendys needs to understand this is about liberty and religious freedom, bigger than Macy&#39;s v. Gimbels. @bev_jack An independent franchisee posted the sign, which he&rsquo;s taken down. We proudly serve ALL customers! @Wendys Just not sure why you have to quality it with "we assume." They&#39;ve published such on their site. Can you acknowledge definitively? @TabithaHale @AlexaShrugged An independent franchisee posted the sign, which he&rsquo;s taken down. We proudly serve ALL customers! @beckpayne An independent franchisee posted the sign, which he&rsquo;s taken down. We proudly serve ALL customers! @mllebastiat An independent franchisee posted the sign, which he&rsquo;s taken down. We proudly serve ALL customers! @creativetweets An independent franchisee posted the sign, which he&rsquo;s taken down. We proudly serve ALL customers! @bodysouls An independent franchisee posted the sign, which he&rsquo;s taken down. We proudly serve ALL customers! @Capit0lism @juliagulia614 Wasn&#39;t what we were implying -- just that we&#39;re honored to serve all our customers! @DLoesch If you wouldn&#39;t mind, pls RT our note to you. We&#39;re hitting our tweet limit and can&#39;t reply 1:1. Thank you! @RBPundit @phyllis_mac Not trying to! Just that we&#39;re honored to serve all!